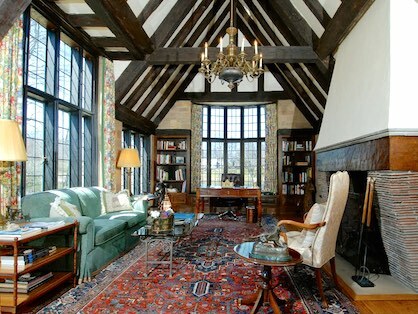 The Tudor house style focuses on indoor living. Its main purpose is to create a welcoming cave to shelter occupants and keep the cold, damp weather out, which makes sense, given the style originated in the rainy regions of England. With a steeply pitched roof and dark half timbering, contrasting with walls of stucco, slate, or brick, the Tudor home is one of the most distinctive styles of residential architecture. The main living area is typically focused on the hearth, which is often set back in an Engle nook or chimney corner. Generally, rooms are small, with wood paneled walls from floor to ceiling and low ceilings with decorative beams. The small rooms of the Tudor home create an overall feeling that is very sheltering. With their charming storybook look, the Tudor style is still used in new construction today, and there are many variations. Depending on the location and size of a Tudor home, home buyers can encounter a wide range of pricing. Because of their typical large size, yet sheltering feel, they can be quite appealing to families. Tudor homes fare well through time, but the multiple roof lines and gables should be checked periodically for water penetration. The timber framing must also be inspected annually for damage and stained regularly. With regards to renovations, the great thing about Tudors is how you can add and subtract in all sorts of ways because it’s such a flexible style. You’ll also want to make sure you utilize an architect who will seamlessly blend the old with the new. A Tudor is a home of rare beauty and original character that would make any homeowner proud.